^ "Report on Business: Great time for European vacation as loonie hits record high against euro". The Globe and Mail. July 12, 2012. Retrieved Nov 9, 2014. ^ "Canada's resilience has foreign central banks loading up on loonies". The Globe and Mail. May 13, 2014. Retrieved Nov 9, 2014. ^ "What's lifting the high-flying loonie?". The Globe and Mail. September 19, 2012. Retrieved Nov 9, 2014. ^ "Seven reasons to invest in Canada now". The Globe and Mail. March 11, 2013. Retrieved Nov 9, 2014. ^ "China likely sitting on billions of Canadian dollars". The Globe and Mail. Oct 2, 2015. Retrieved Jan 13, 2016. ^ "Why a world in turmoil is still parking its cash in Canada — lots of cash". The National Post. Dec 31, 2015. Retrieved Jan 13, 2016. 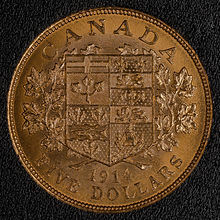 ^ "Canadian Penny Discontinued: Feb. 4 Marks The Official End Of Canada's Copper-Coloured Coin". Huffington Post Canada. February 1, 2013. Retrieved Jun 28, 2013. 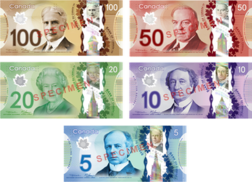 ^ "6 US Destinations That Will Accept Canadian Money Without Converting It". NARCITY. Mar 14, 2016. Retrieved Feb 11, 2019. ^ "XE Currency Charts: USD to CAD". XE.com. Retrieved Feb 11, 2019. ^ "How & Why Oil Impacts The Canadian Dollar". Investopedia. Oct 16, 2018. Retrieved Feb 11, 2019. ^ "A Look At The History Of The Canadian Dollar". KnightsBridgeFX. Retrieved Feb 11, 2019.